Paul calls Timothy his true son in the faith [1 Tim 1:2], and in his first letter to Timothy, Paul largely instructs and encourages the younger man. At this point Paul is probably rather old already, with plenty of experience in terms of the Christian life, church-planting and teaching. This verse has traditionally been used to speak to young people – I first heard a leader or a pastor encourage us directly with this verse when I was 14 or 15. I’m now about 1 month short of being 22, and I would like to think in the eyes of many I’m still a young thing. But in the 7 or 8 years that have passed, the significance of this verse has turned from just an elder man’s nagging to a verse that I hold on to dearly. Paul may be referring directly to Timothy, or young men, when he says to set an example, but I believe there are immense messages in this verse no matter how old we are. Don’t let anyone look down on you because you are young – It is on the onus of the young to act in a way befitting of respect and honour. A lot of times young people know that they can get away with things, and thus they act irresponsibly. I remember a couple of years back, a senior told us that if members of the public question what we were doing, just tell them that we are students as that would make them drop the matter. We weren’t doing anything bad, just running about and making a lot of noise – but the mentality that we are still young and can afford to be irresponsible will not lead us to respect. I’ve often been told, ‘you’re only young once’ when being persuaded to do certain things. I don’t disagree with the notion that I’m only young once, and that the vigour and energy that I have today will one day depart me – but it is extremely important that as Christians, we do not place our boundless energy into things that will displease God. Usually, the things that will displease God will also sully the name of God. Paul states 5 things that Timothy should be an example of – speech, life, love, faith and purity. There’s no switch in life that says, ‘be an example’. You cannot switch on this button on a good day when you’re living everything right and turn it off when you’ve a bad day. 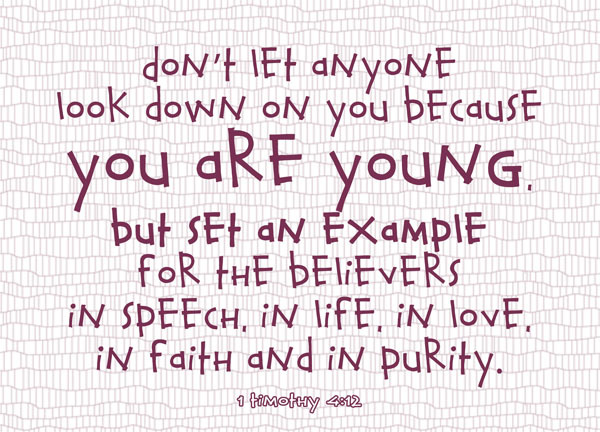 Everybody can be an example to anybody regardless of age. You can be a student, and yet you can be an example to your teacher if you live an exemplary life. It’s a 24/7 thing. People watch you while you don’t think anybody is. Speech – the word speech suggests that Paul is referring to daily and normal conversation, and not the words that a leader like Timothy was expected to preach. A person’s speech reveal much about him or her, and people listen and are influenced by you. It is one thing if you do not encourage people through your speech, but it is a horrible thing if you stumble people with your speech. Life – this is perhaps the most differently translated word across all the translations – the other 4 are largely similar, but I’ve seen behaviour, conduct, spirit, manner of life, deportment, way of life in replacement of life here. Referring to these other translations more or less explains what Paul meant by life here. I believe he meant an intentionally spiritual, Christian way of life. As Christians, whatever happens, we need to conduct ourselves in a manner that is worthy of the gospel of Christ [Phil 1:27]. Faith – I’ve always felt that a leader’s faith will directly translate to the general faith of those he or she leads. How do we know someone is faithful? Through the things he does (action, life) and through the things he says (speech). I personally believe faith is contagious, and nothing is more uplifting to God or encouraging to your brothers and sisters-in-Christ than an act of faith or a declaration of faith – especially in times of trials. Similar, if your faith crumbles, the faith of those around you wavers. Love/Charity – not just to men, but also to God. Love should be the principle and chief motive behind all our conducts. It should be the fuel of our lives. It should be the intention behind everything that we say. When a Pharisee asked Jesus which of the Commandment is the greatest, Jesus replied: “‘Love the Lord your God with all your heart and with all your soul and with all your mind.’ This is the first and greatest commandment. And the second is like it: ‘Love your neighbor as yourself.’ [Matthew 22:37-39] It’s both about love. Paul, in his great exposition on love in 1 Corinthians 13, says if I have the gift of prophecy and can fathom all mysteries and all knowledge, and if I have a faith that can move mountains, but have not love, I am nothing [1 Cor 13:2]. Even if we say encouraging things, we live an exemplary life, and we have great faith, if love is not the fuel of these, we are nothing. It’s just that simple. God is love. Whoever does not love does not know God [1 John 4:8]. Purity – this was perhaps very relevant to a young man. When you are young, and you are not bounded to a family or to a partner, it is hard to stay pure as there are greater temptations to break rules. Paul is perhaps referring to the chastity of the body and mind, as per 1 Timothy 5:1-2 – Treat younger men as brothers, older women as mothers, and younger women as sisters, with absolute purity. Or maybe Paul is also referring to purity in relation to the other 4 which he had mentioned, very much like his style – stay pure in language, stay pure in conduct, stay pure in faith and stay pure in love. You don’t need to be young to consciously set an example – in fact, the older you are, you are probably more obliged (by society) to be an example. The 5 things that Paul mentions in this verse will apply to any Christian, regardless of age. The one main thing that is aimed at younger people, is the notion – do not let anyone look down on you, let no man despise you because of your age, do not be afraid. Conversely, it can also be applied to elder people – let the young have a chance to speak. Let them have a chance to opine. Guide them with love, and not by blowing out their words. This is in no way asking the youthful to be disrespectful of their elders, but it is a challenge for the youth to work hard so that they will earn respect from their elders. Respect is earned, but honour is given. I am very conscious about my age, which though not always true, generally does reflect lesser experience (in life) and a weaker understanding of the Bible (due to having lesser time spent reading and studying God’s words). My lack of life experience and my age is something I cannot help, and when being accused of being too young to know what I’m saying, I often feel helpless and can only return to study the Bible doubly hard. I’m not all that young anymore, but I understand that I still retain a lot of the flippancy of a young person which I hope to shed in time to come. Which is why I appreciate you very much for having the patience to bear with a little young nothing like me. Thank you, but above all, thank God for you. He doesn´t want our work in Him to be manipulated by the opinion of others. let your yes be yes and your no, no. i appreciate you for leading me into all these wornderful details you discover about His Word, and if you are 20 or 200 doesn´t matter to me. Zecqi, Good one! You do great stuff! Trust Jesus with your future! He’ll bring you directions where you never thought and bless you with blessings you never imagined! I’m a big fan of your stuff! Keep it up! Really great reflections! There are alot of advantages to being young — most importantly, you are not afraid to take adventures or take risks — especially while being a light in a dark world. The Lord continue to be with you.